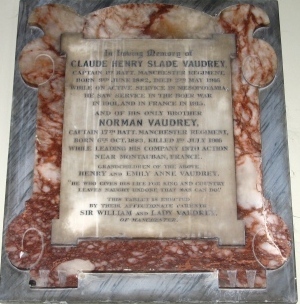 Claude was born at Eccles, Lancashire on 3rd June 1882, the eldest son of Sir William Henry Vaudrey Kt. (Solicitor), sometime Lord Mayor of Manchester and a director of the Manchester Ship Canal Company, and Lady Eleanor Florence (née Slade) Vaudrey, of "The Gables", Manchester Road, Buxton, Derbyshire. (Later of 33 Mount Avenue, Ealing, London.) He was educated at Bilton Grange and Rugby [1897 - 99], before serving his articles as a Solicitor with the firm of Vaudrey, Osborne and Mellor. In 1901 the family were living at 84 Eccles Old Road, Pendleton, Slaford, Lancashire (Census RG 133715) and Claude was employed as a "Solicitor's Clerk". He later served in the South African (Boer) War and after the War he remained on the Reserve Force and qualified as a Solicitor. When applying for her husband's medals, Claude's Medal Index Card gives her (their?) address as: The Lodge, South View, Crowborough, Sussex. (De Ruvigny's Roll of Honour, Vol. 2, p. 302) In November and December 1916 Claude's 'effects' were returned to Harriett, amounting to £138 15s 7d (£138.78 - about £8,635 today - 2016). On the 27th April 1900 Claude was gazetted 2nd Lieutenant to the 6th Militia Battalion of the Manchester Regiment [London Gazette, 8 May 1900] and served with the Battalion in the South African (Boer) War, taking part in actions at Orange River Colony and Cape Colony, between March and 31st May 1902. He received the Queen's South Africa Medal (3 clasps). Claude returned to England on board 'The Guelph' on the 7th September 1902. In February, 1915, he came home on leave, and, being lent to the War Office by the Colonial Office for the duration of the War, he was attached to the 3rd Manchesters at Cleethorpes. His Medal Index Card shows that he served in France from August 1915, before being transferred to Mesopotamia with the Indian Expeditionary Force in November. By then the casualties in the Indian Corps had become so heavy, and the difficulty of reinforcement and replacement were so insuperable, that it was decided to move it to another Theatre of War. By the end of the first week in January, 1916, the Indian Corps had reached Basra at the head of “the Gulf,” destined to take part in the Campaign in Mesopotamia and especially in the Operations about to be undertaken for the relief of the British force besieged in Kut. 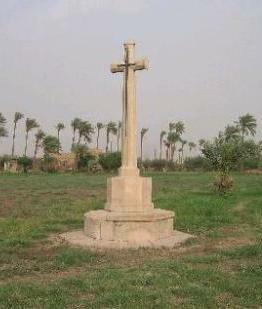 The Corps could not prevent the fall of Kut, and in the operations that followed for the expulsion of the Turkish from Mesopotamia, the Battalion was frequently engaged in the attacks on the Turkish positions at Hannah (21st January 1916) and in the assault upon the Dujailah Redoubt (8th March 1916). Advancing across a front of 400 yards [366 m.], they came under heavy fire from the Sinn Aftar redoubt and cross fire from supporting trenches; they gained a footing in the redoubt and took two trenches. However with bombs running out and under heavy counterattack from the left flank, they were forced to retire with many casualties. [CWGC Records show that the Battalion had 164 Officers and men killed in action on the 8th March 1916, only 5 have a burial place, the remainder are Commemorated on the Basra Memorial. The Battalion attacked again on the 5th April, this time successfully, taking the Abu Roman mounts and beating off a Turkish counter attack. A further advance was made on the 17th and when strongly counter-attacked the Manchesters and the 47th Sikhs blocked and held the north end of trench X holding the position and causing a large number of casualties amongst the Turkish attackers. 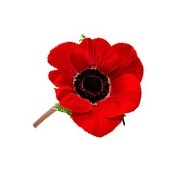 Claude died on 2nd May 1916 of cholera contracted whilst on active service. 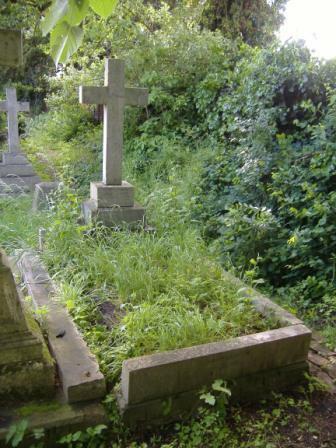 He was buried on the banks of the River Tigris before being removed to Amara Cemetery, but in 1933 all of the headstones were removed from this cemetery as salts in the soil caused a rapid deterioration of the stone used. Instead a screen wall was erected with all of the names engraved upon it. "Particulars have come to hand respecting Captain C. H. S. Vaudrey of the Manchester Regiment, who died in Mesopotamia two months ago. 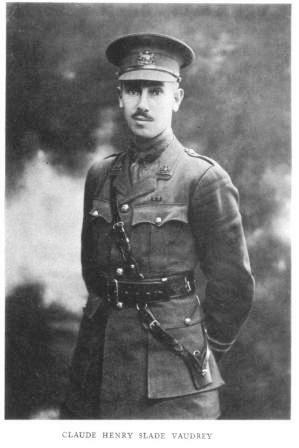 Captain Claude Vaudrey was the elder son of Sir William and Lady Vaudrey. He was Assistant Colonial Secretary in Sierra Leone, and was transport officer there in connection with the Cameroon Expedition. Captain Vaudrey saw service during the South African War." honoured, admired and respected him. I feel that one of my best friends out here has gone. Abu Roman Mounds on the right bank of the Tigris." on the First Day of the Battle of The Somme, 1st July 1916. 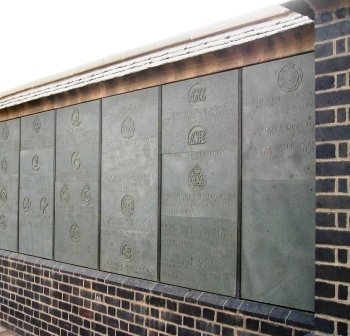 · "The Manchester Regiment 1899 - 1958 "
In 1933 all of the headstones were removed from this cemetery and a screen wall was erected with all of the names engraved upon it.